A sure sign of summer, blueberries! I wish I could tell you these are fabuous wild blueberries that I picked while frolicking through the forest but the truth of the matter is my local market had a sale for 99 cents a pint and I couldn't resist! So I thumbed through some recipe books and sites for a great recipe to use up my bargain find and found this wonderful recipe on the Cooking Light site. BUT confession, my version is not the light one. I modified it for the real thing. For me, the perfect ice cream is truly heaven with the full fat stuff! Enjoy! In order to chop the blueberries I used my handy mini processor. 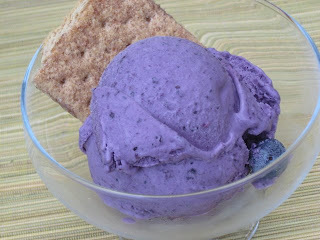 It left enough chunks but also enough puree to form the wonderful blueberry flavoring. 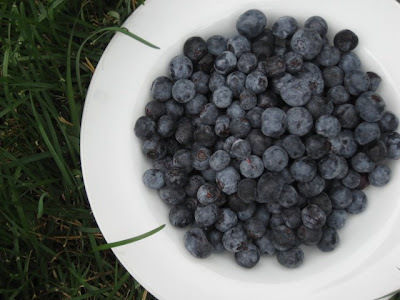 Combine chopped blueberries, powdered sugar, and 1/4 c of water in a small sauce pan; bring to a boil. 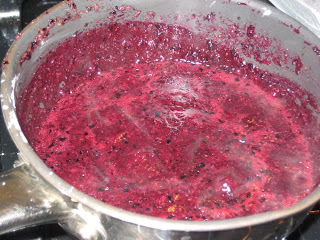 Reduce heat, and simmer for 10 minutes or until mixture thickens slightly, stirring frequently. Remove from heat and cool completely. For some reason this looks more like raspberry but I promise its blueberry! 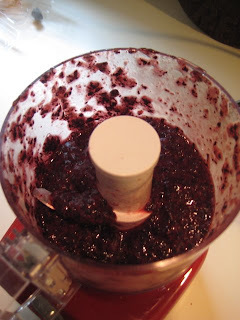 Combine first three ingredients in a large bowl; beat with mixer at high speed until smooth. Combine cream and half&half in a medium saucepan; bring to a boil. Remove from heat. 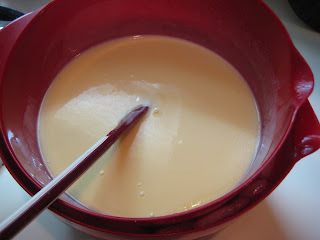 Gradually add half of hot mixture to cheese mixture, stirring constantly with a whisk. Return mixture to a pan. Cook over medium-low heat until it lightly coats a spatula (or 160 degrees). Place over an ice bath (as shown) and cool completely. BTW...these Kitchen Aid mixing bowls are an essential ice cream making tool. Great for ice baths and much more. I LOVE the color, T!